Jennifer Yen, CEO of Pur~lisse has made it her company’s mission to reinvent and modernise Asian beauty secrets into high performing and multitasking products to suit all skincare needs. Earlier in her career she played a villainous character on the infamous Power rangers TV show but after 15 hours a day wearing heavy makeup under bright lighting her complexion worsened and her confidence plummeted. Jennifer went on to rediscover her grandmother's Asian beauty secrets and ingredients she was shown growing up; this was the beginning of her mission and she then went on to create the Pur~lisse Asian-American skincare range. 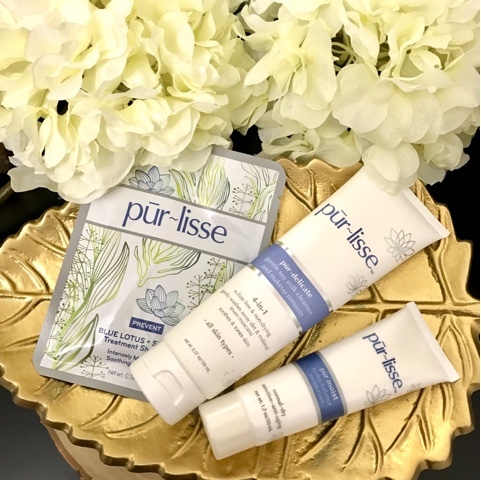 One of my favorite products from Purlisse is the Blue Lotus and Seaweed Treatment Mask - A natural fiber mask infused with Blue Lotus; one of her grandmothers secret ingredients known for its powerful antioxidant properties and its ability to detox the skin. It also contains Seaweed and restorative Asian botanicals delivering antioxidants and minerals to your skin. This power blend soothes and nourishes while the White Mulberry brightens and Anise fruit provides continuous moisture, leaving skin healthy, beautiful and radiant – Available for all skin types, even sensitive skin! Another great product from the Pur~lisse range is the Blue Lotus 4 in 1 cleansing milk. The Blue Lotus cleansing milk is infused with Soy Milk, Whole Oat and White tea; White tea has been known to heal cellular damage -another Asian beauty secret. This product is a gentle soap and sulphate free cleanser that washes away dirt, impurities and makeup in one simple step. The Pur~lisse Blue Lotus balancing moisturiser is also a must have to add to any skin care ritual, it contains White Tea, Vitamin E and French Marine Plants; amazing skin strengthening and moisturising properties yet again. Its fast-absorbing, soothing formula instantly delivers intense hydration and prevents fine lines and wrinkles for healthy, dewy and supple skin. This moisturizer is now on sale for $30 get shopping guys! The Pur~lisse skincare range is suitable for all skin types and ages and would be a more than adequate addition to your daily skincare routine. One lucky person will win pur~lisse’s 4-in-1 Blue Lotus Eye Adore Serum (worth $65)! To enter, simply fill out the form below! A winner will be announced December 16, 2016. Good luck!! *Disclaimer: I received these products for free for review purposes. All opinions are my own.